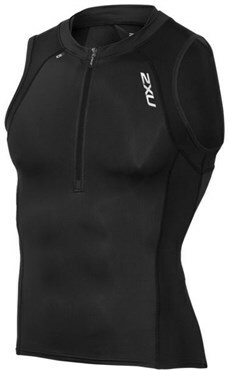 For triathletes looking to conquer their next long course race, 2XU presents this Compression Tri Singlet. Specifically engineered to combat injury and fatigue through high heat events, the Compression Tri Singlet comes with ICE X CT technology to protect against harmful UV rays, while proprietary 2XU 105D/CK fabric supports muscle and offers superior moisture managemnet. Featuring two rear angled pockets for storage, this singlet is finished with VENT MESH technology for critical breathability through intense performance.